Cannonball! The weather is hot and it’s time to cool down with some fun in the water. If you’re getting ready to throw a pool party for your little one or invite friends over to float and chill, there’s always room for DIY menus and crafts to make it even better. From sharks, to adult drinks, to candy displays and more, these next pool party ideas will keep your party afloat. Make your little one’s birthday pool party a splash with these gummy skewers! 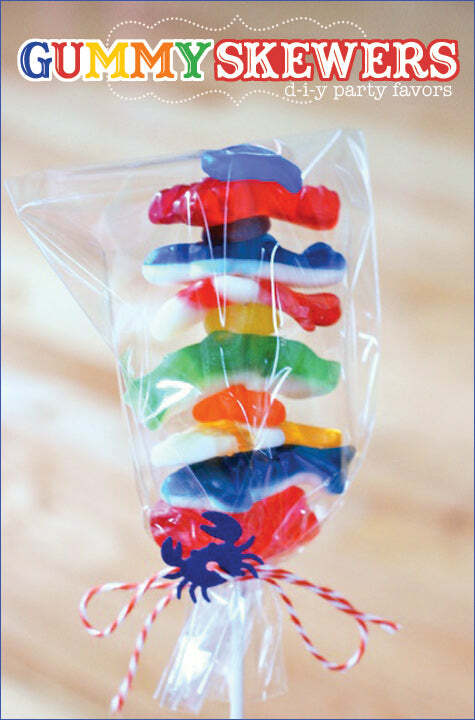 With a wooden or bamboo skewer, gummy fish, sharks and sea creatures of your choice and individual cellophane wrappers, you’ll have an awesome, individual size dessert or party favor for all of your child’s friends to take home. Getting those little fishies out of the water won’t be any trouble at all when you wave these around on the pool deck. 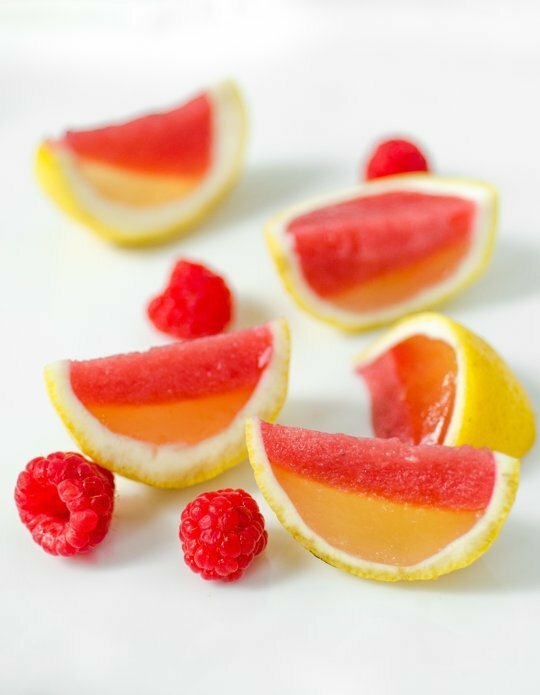 An inventive twist on the typical Jell-O shot, these lemon slice adult Jell-O bites are both refreshing and fun. Using lemon peels as the cup and raspberry and lemonade flavored alcoholic gelatin in the middle, these two-toned sweets are show-stoppers. Place these in the fridge and bring out a platter mid-afternoon when the sun is hot and your guests need an alternative happy hour treat that will cool them down and mellow them out. 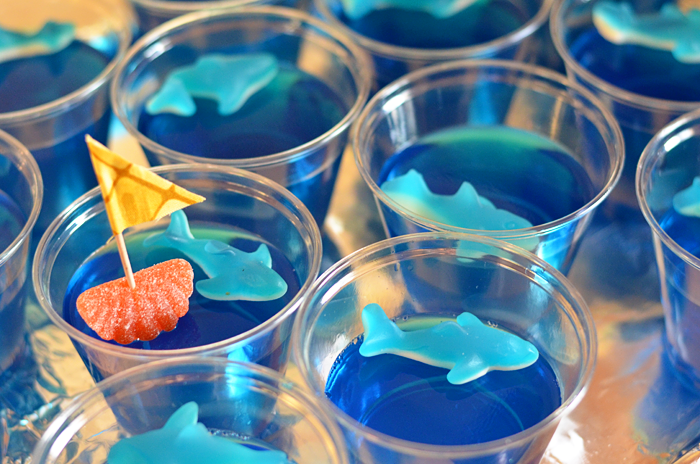 Turn a regular pool party into a fishing-themed extravaganza with these adorable bait cups. 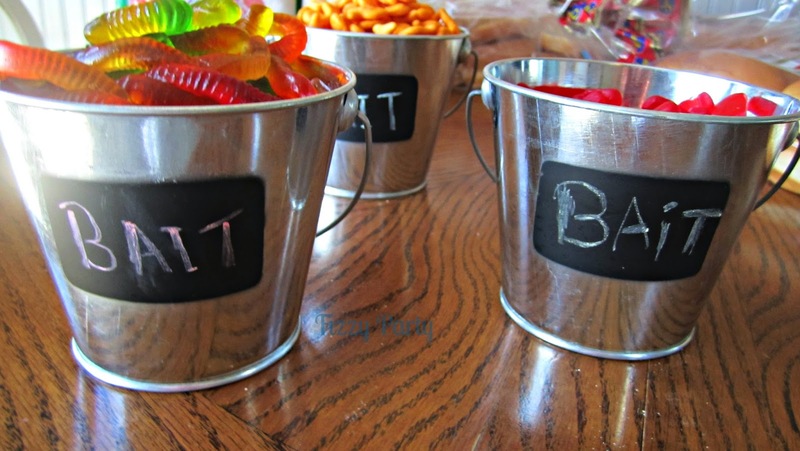 With little tin buckets you can find online or at the dollar store, all you’ll need are Goldfish crackers, Swedish Fish, gummy worms and any other fish or gummy themed crackers or candies you can think of. You can set these out as centerpieces or place settings on a picnic table by your pool or wrap them up for guests to take home. Have a margarita in one bite! 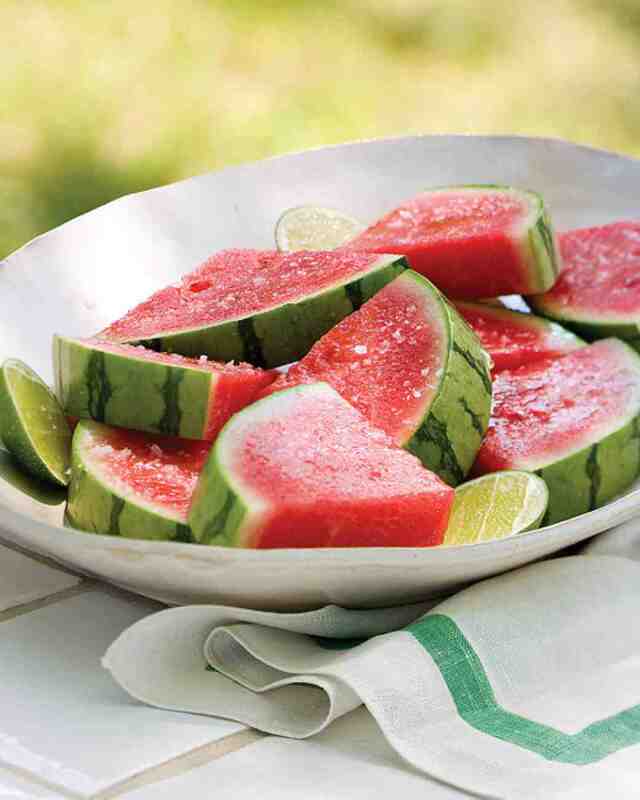 These Martha Stewart tequila soaked watermelon slices are an easy “drink” recipe that doesn’t require any mixing, stirring or manning the bar. Since you can simply place these slices on a platter and let guests help themselves (within reason! ), they’re a perfect party “drink” alternative so you can sit back and relax. Just make sure to buy good quality watermelon and drink ingredients and you’ll have one tasty treat your guests will beg you to make every summer. 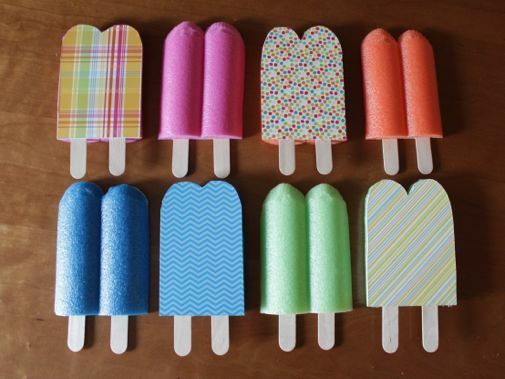 Prepare for a fancier poolside dinner party while keeping the whimsy with these popsicle placeholders! Originally meant to be sent as postcards, we think they would make lovely name tags for seating arrangements and look thematic and adorable on your poolside table. With foam, popsicle sticks, glue and some colorful wrapping or scrapbook paper, you can transform a regular summertime dinner party into something extravagant and fun. Follow the video tutorial here. Ahoy, mateys! 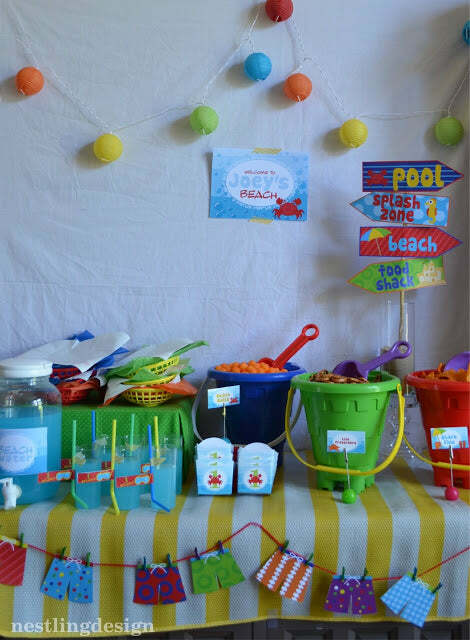 Make a tidal wave at your child’s birthday or summer pool party with this beachy and fun display. Using this blogger as inspiration, you can choose the color scheme and menu that fits your design and food tastes! Try pink and yellow for a little lady or a rainbow of colors for a child who loves everything bright. Simply buy some beach pails and shovels, fill them with sweet and salty snacks of your choice and set up a buffet table poolside for an easy serve-yourself dessert, lunch or snack display. Don’t want to separate the kids from you and your friends? 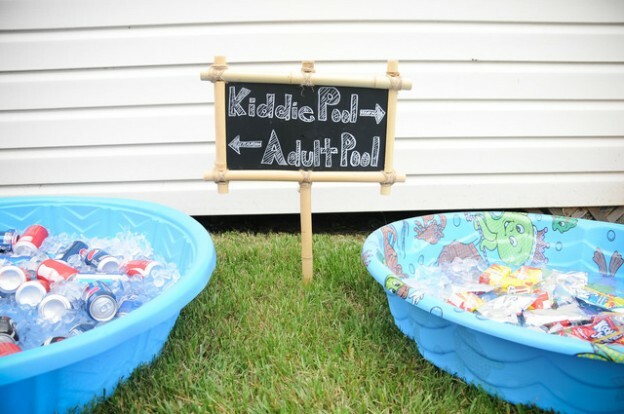 Throw a fun adult pool and kiddie pool party! By setting up two small kiddie pools and filling them with ice, you essentially have two giant coolers on your hands. What you fill them with is entirely up to you, but let us suggest juice boxes, Capri Sun, and bottles of lemonade for the kids and then fancy adult sodas for the grown-ups. Then, all you need to do is make a sign with dry erase board, paper and marker or chalkboard and you’ll be ready to go!